KIEV, Ukraine -- Detente policy in the Cold War, conflict prevention and protection of human rights were the goals set when the Organization for Security and Co-operation in Europe was founded 40 years ago. How has the OSCE managed? Not too long ago, the Ukrainians were the ones who wanted to help others. When Ukraine took over the chair of the Organization for Security and Co-operation in Europe in January 2013, the OSCE was dealing with dormant conflicts. Just over a year later, Russia annexed Crimea and battles were taking place in eastern Ukraine. Now, 40 years since the Helsinki Accords established what would become the OSCE, Ukraine has become one of the organization's most important challenges. OSCE oversees ceasefires and takes part in negotiations with the Minsk Group. 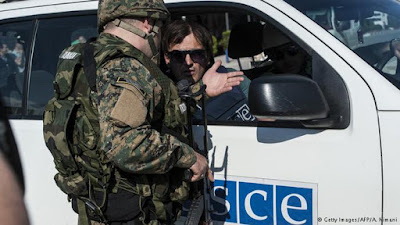 Only a few years ago, the OSCE had come to be known as a paper tiger and had almost been forgotten. The conflict in Ukraine has returned it quite prominently to the limelight. The organization has its roots in the Cold War. In the summer of 1973, the Conference on Security and Co-operation in Europe, an initiative of the Soviet-led Warsaw Pact, began its undertaking. It sought to alleviate tensions in the conflict between the East and West blocs. Two years later, on August 1, 1975, 35 heads of state and government signed the Helsinki Final Act. They pledged to offer more security, solve conflicts peacefully and respect human rights. Helsinki groups were formed to support human rights in the East bloc. After the bloc's collapse, the Commission on Security and Cooperation in Europe faced challenges such as building democracy in the successor states of the Soviet Union, with a major mission being the monitoring of elections. In 1995, the CSCE became the OSCE. Now, the organization, headquartered in Vienna, boasts 57 countries, including the United States, a founding member. OSCE decisions require a consensus, but are not binding under international law. For over a decade, observers have noted the growing schism between Russia and Western states in the OSCE. Moscow has accused the organization of operating with "double standards" in human rights issues and interfering in internal affairs. In 2006, Foreign Minister Sergei Lavrov even threatened the organization with Russia's withdrawal. The OSCE did not send observers to Russia for the parliamentary elections in 2007 and 2011 or the 2008 presidential election. However, the OSCE representatives did complain about the harsh restraints that Moscow had adopted. The OSCE has neither managed to solve dormant conflicts like the one in Nagorno-Karabakh nor active ones, such as in Georgia in 2008. Ever since Ukraine's current conflict began, the OSCE seems to be facing the same problems it had 40 years ago. Politicians deny it, but there is more and more talk of a new Cold War nowadays. In its annexation of Crimea, Russia has "in many ways" violated basic principles of the Helsinki Final Act, including the renunciation of violence and the inviolability of borders, says Wolfgang Zellner, head of the center for OSCE research at the University of Hamburg. A few weeks before the body's 40th anniversary, a new diplomatic scandal shook relations between the OSCE and Russia. Finland refused entry to the Russian parliamentary chairman Sergei Naryshkin and five other Russians who wanted to attend the session of the OSCE parliamentary assembly. As a justification, Finnish officials cited the EU sanctions against Russia. The entire Russian delegation stayed home in protest. Despite many setbacks, there are observers who do not think that the organization has failed in its mission. "The OSCE itself is a relatively weak organization," Zellner said. It is supposed to manage conflicts. Zellner does not believe that it would make sense to suspend Russia from the OSCE. "If Russia is suspended like Yugoslavia was (1992-2000), then the OSCE would have no raison d'etre," Zellner said, "and then it may as well just be dissolved." Oleksandr Sushko, former Ukrainian national coordinator of the Eastern Partnership Civil Society Forum, agrees. The OSCE was not able to prevent the annexation of Crimea. Besides, he told DW, there are no other alternatives to the OSCE's monitoring mission in eastern Ukraine. That's why Ukraine's government is not interested in suspending Russia either. "If we require structures to accuse Russia of crimes to its face, then we cannot exclude the country from the OSCE," Sushko said. In 2016, Germany will preside over the OSCE. Ukraine will likely remain a top priority, and Zellner believes that Berlin will try to "put dialogue with Moscow back on track."